A shady sideyard is paved with reused stone and gravel. Generous pots, the client's collection of whimsical ceramic frogs, and a birdbath add interest and form to the narrow area. Beginning groundcovers will fill in densely. The pathway is shared with neighbor. A variety of textured and colorful shady plants fill the area for beauty and interest all year. 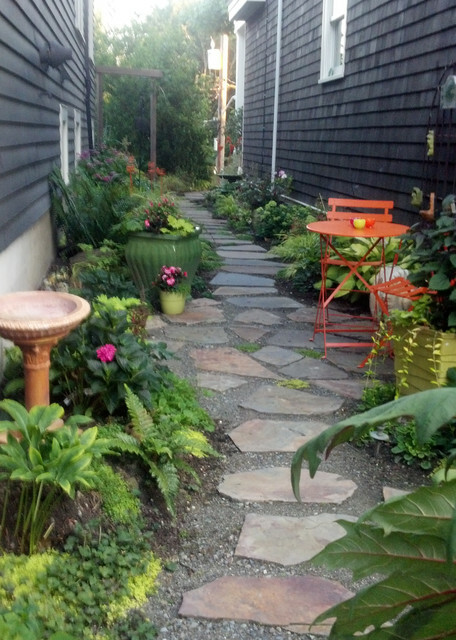 Great casual outdoor space and perfect for this narrow path walkway .